This intermedia performance, using modern technologies, focuses on audio modulations and visual structures that through heterogeneous environments and the subversion of simultaneous data transfers from internet-based digital video communication systems enter the field of artistic intervention. Using various software solutions, the author intervenes in the creative process, thus forming digitally manipulated textures projected on three visual screens. 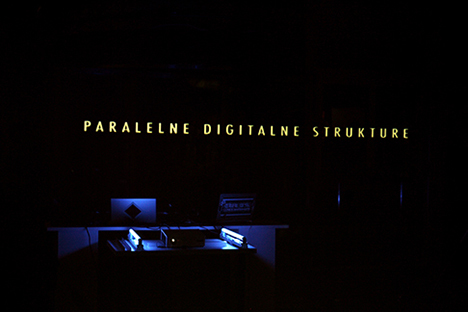 Together with the sound spectrum, Internet connection, computer components and small control objects they form an active infrastructure for live manipulation with arrived digital packets and parallel signals relevant for creating an audio-visual composition. The whole performance exceeds the classical methods of creating audio-visual compositions, experimentally taking on the search for new means of expression in the field of art and technology. The process of transfer in the intermedia structure can be described by distance shifts of coded packet signals on a time line and relevant statistical variations, which, however, lose certain pieces of information in data channels. And it is here that the author, through additional means, inventively intervenes in the codes of technology, exploiting missing or imperfect elements, generating, joining and distributing them into separate compositional elements. Marko Batista is Ljubljana-London based mixed-media artist. Together with Miha Horvat (son:DA) he founded the multimedia group KLON:ART:RESISTANCE. Several projects researching the field of digital image transformation processes, networking data, displaced sound-scapes and hybrid structures have been presented at festivals, galleries and different urban places.